Ambler photo journalist Laura Kicey continues her three part series documenting her weeklong journey of the mystical country called Iceland. Kicey’s trip was funded entirely by a new, innovative website called kickstarter.com – which specializes in micro-patronage for creative ventures and concepts. For other kickstarter.com success stories, visit their website. 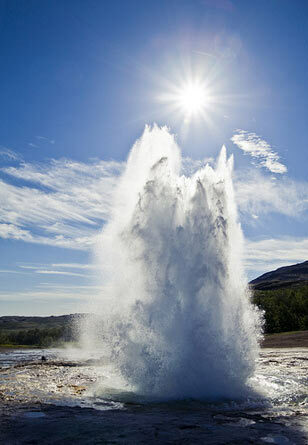 Pictured is a fortuitous shot of The Great Geysir of Iceland, for whom all geysers are named. The Geysir first erupted in the 14th century. It used to erupt every 60 minutes until the early 1900s when it became dormant. Earthquakes in June 2000 subsequently reawakened the ‘sleeping’ giant and it now erupts approximately every 8 to 10 hours. The Geysir, for which all geysers are named, burbles and steams constantly in between eruptions. The explosive drama of the geyser’s spout against the backdrop of the purple, June-time landscape, surrounded with jewel-toned pools of steaming water, rich blue skies and intense sun was quite rousing. But, the intensity and raw power of our next stop at Gullfoss, the grandiose Golden Falls, dwarfed even Geysir. When you pull into the parking lot, you can neither see nor hear this raging force of water cutting into the land, but after a short walk over the hill, the turbulent wind and mist grab you and start to pull you into the core of Golden Falls. Standing on a ledge a few feet from the edge, separated by only a single thin wire, the wind at your back edging you forward, it would be easy to get swept away by its puissance. The map, that my faithful navigator Sandra was consulting, appeared to suggest the most convenient route to get back to Reykjavík, passing by Þingvellir (a large national park), would be Route 365, rather than double back the way we had come. As we turned off the main road, the terrain immediately changed as we crested our first (and certainly not our last) blindhædir and entered the most desolate lunar landscape we had seen yet: moss, volcanic rubble, and craggy mountains as far as we could see. When we stopped to take some photographs at one point, when we stopped speaking we realized the air was utterly silent. The occasional SUV was the only reminder we had that the road we were on actually led anywhere: there were no buildings, fences or animals, only the thick dust clouds that rose as passing vehicles disappeared – after forcing us off the narrow roadway, that is. Part of Laura's challenge was navigating the desolate, and many times dangerous, roads that are par for the course in such a land. “Even on the major roadways, there is a peculiar lack of signs indicating direction or distance to and from major points in Iceland,” explained Kicey. 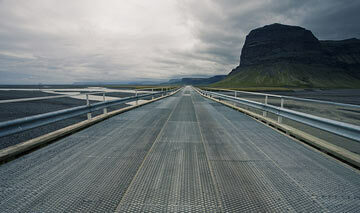 Miraculously, we emerged on the other side of this no man’s land back on a main road, hurtling towards Reykjavík. After dinner, we ended up taking a stroll through the streets of the city, taking in the last rays of daylight around 11 p.m. We did have to make it an early night, as the trip we had planned for our second full day was going to be quite an undertaking: driving from Reykjavík to the glacial lake of Jökusárlón in the southeast of the island and back again – about 12 hours on the road altogether. The weather that met us each day seemed perfectly appropriate for the character of the day’s wanderings, and the gray gloom of this day was no exception. Our first stop, about two hours drive from Reykjavík, was Vík (fully: Vík í Mýrdal), which greeted us with some characteristically stunning visual drama – deep black sand beaches, fast-moving gray clouds with a mist of rain, and towering cliffs dressed in lupines and fog. 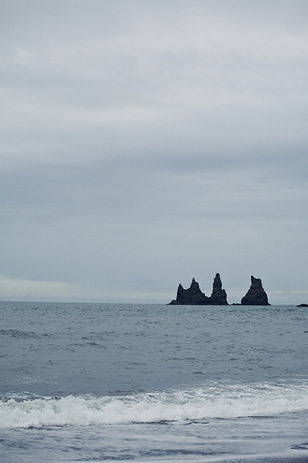 After a quick lunch of soup and bread, we walked the beach, admiring the Reynisdrangar – columns of black basalt said to be trolls petrified by morning light – and the swirl of nesting seabirds, mostly puffins and fairy terns. 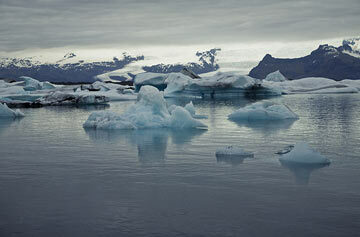 When we’d had our fill of rolling about on the black sand, we took off towards Vatnajökull and the glacial lagoon. The landscape changed quite distinctly at several points along the Ring Road on the south coast, and frequently hid the ocean from view although we were quite close to the shore. The glaciers of the Icelandic Interior (the remote central highland region that is off-limits most of the year), including Mýrdalsjökull and Eyjafjallajökull, were always visible in the distance, remaining the sole constant as the roadscape shifted from flat, lupine-covered plains to barren black lava fields to placid glacial rivers reflecting the gray sky. We stopped to take a closer look at the moss-covered volcanic rock and found the moss to be incredibly thick and bouncy – closer examination proved even more like walking on the moon than just appearances. Vik is an Icelandic coastal village, known for its popular offshore spires called Reynisdrangar, meaning ‘troll rocks’, which are actual columns of black basalt. Legend has it the ‘trolls’ became petrified by the sun as they were dragging a boat to shore. Even on the major roadways, there is a peculiar lack of signs indicating direction or distance to and from major points in Iceland. No matter how far removed you feel from civilization, however, it is rare that another vehicle is all too far behind you as the last disappears from sight. The road dips inland at Skaftafell National Park, close to the Vatnajökull glacier, and turns back out towards the water – and there, suddenly, icebergs are upon you! Sandra and I stopped dead in the parking lot and shrieked with delight in the car: unimaginably majestic, the icebergs were an amazing shade of pale blue-green, with veins of black. They are constantly moving, but ever so slowly, out to sea – breaking, colliding, melting. Being in their presence is peaceful, like watching the ghosts of long-dead giants passing by. Tomorrow there will be all new icebergs, and those I saw will be long gone, but quite unforgettable. 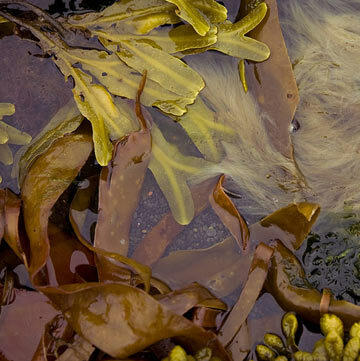 Seaweeds have been used in Iceland for over a thousand years for various purposes including food, animal fodder, fuel, manure, dyeing and medicinal purposes. Humans have been consuming some variations of the seaweed since the year 961. The edible seaweeds were chopped, cooked and then prepared with milk and flour to be eaten as a nutrient-rich thick pudding. Doubling back again through the alien landscapes, hoping to see Svartifoss (a remarkable waterfall in Skaftafell which inspired Reykjavík’s most impressive cathedral) before returning to Reykjavík, we were told at the visitors center it would be a 45-minute hike each way. We decided that with 4 hours on the road still ahead of us plus a dinner stop, we couldn’t afford it. We carried on through to Vík where we paused long enough to stop at the Strondin Bistro; the service was fairly awful, but the burger that filled our empty stomachs at 10 p.m. could not be matched for divine flavor. The weather was taking a turn for the worse: fog was darkening the skies and the rain was coming down more steadily. Driving up a very steep mountainside cloaked in milky haze, the edges of the road dropped off from imagined cliffs. It was a harrowing drive home, especially for someone who hates driving as much as I do (Sandra does not have a driver’s license) and is unfamiliar with the twists and turns of the road ahead. Still, it wouldn’t be the last of our death-defying driving. We made it back to our Reykjavík base quite late and packed our bags so that we could launch early for the West Fjords and Strandir Coast. The drive northwest along the Ring Road was fast-moving, and we paused only a few times to admire the changing landscape before we were abruptly ejected onto one very rough road. We stopped almost immediately at a stretch of rocky beach when I was struck by a rainbow-like array of seaweed and kelp in every imaginable color washed ashore. Unlike every other beach I have ever been on, despite the massive amount of dead and decaying organic matter, it smelled fresh and salty and was a feast for the eyes. When we got back on the road, I was only willing to go about 30km/hr, but we soon realized we might never get to Djúpavík at that speed. The road from there on out was extremely rough, paved with only stones or dirt, and barely one and a half lanes wide. We pulled into Holmavík a couple hours later, which is the last “big” town on that route in the north – about 300 residents. After refueling the car, we stopped by Café Riis, a tiny pub, for some lunch. Expecting a rustic, pub-style meal, we both ordered a roasted bacalao (salted cod) dish with potato cake and salad. We were blown away when we were served beautifully presented platters worthy of a much more upscale restaurant: all locally-produced cheese, fish and shrimp. It was impeccably prepared, with delicate, bright flavors. The road heading north from Holmavík was even narrower, and followed the bend of every fjord, making the drive woozily repetitive but ever more harrowing as the roads became increasingly rugged. Although as the driver, it was hard for me to appreciate it fully, the weather and the scenery were stunning. Golden sunshine was chased by brief bursts of showers inland, dramatic clouds played over the mountainsides and ocean views; breathtaking terrain rolled past, dotted with tiny farmhouses and clusters of sheep, and waterfalls appeared at regular intervals. The last two fjords before our arrival were particularly treacherous, and I had to do everything in my power to keep my cool. Sandra would point her camera out the window to shoot the scenes for us to view later, averting her own eyes as the drop induced a bit of vertigo. The final kilometers of road into Djúpavík hugged a cliff face with falling rock tightly to our left, and went into a sheer drop without a guardrail abruptly to our right. 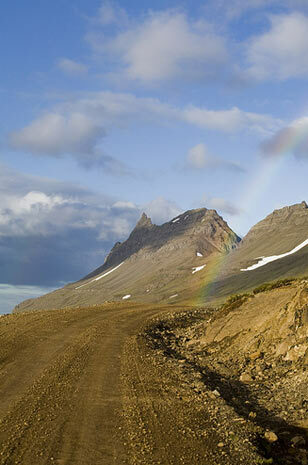 Around the last turn of the fjord, our jaws both dropped when a wide rainbow touched down on the road in front of us. As we pulled into Djúpavík around 9pm, on the longest day of the year, we were both shaken and awestruck. We were shown our room by our kind host, Eva, then unpacked and decided to take in some of the midnight sun. Laura Kicey is a photographer and artist based just outside of Philadelphia, PA. Her work has been shown in a number of galleries regionally, and has appeared in numerous publications internationally. Laura can generally be found lurking in dark alleys and other places she likely should not be. For more of her work, visit her website at: laurakicey.com. Laura’s email is: lk@laurakicey.com. To read part one of Kicey’s travelogue, click here.